A Brief History of Franklin Canyon, as related to Combat! 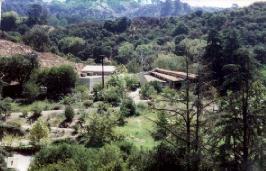 Overview of the Franklin Canyon Visitor Center, looking east. What is now the parking lot was a frequent location filmed in "Combat!" The origin of the name Franklin Canyon is unknown, but it was thus labeled on a map as early as 1888. Following the 1892 discovery of oil in Los Angeles by Edward Doheny, the population grew, but the scarcity of water stifled development. In 1914, William Mulholland, who developed the complex water systems for the Department of Water and Power (DWP), began construction of the reservoirs in Franklin Canyon to provide the main water service for downtown and west Los Angeles. The Upper Reservoir, seen in Combat!, was intended only to provide stability to the main facility and electric generating plant at the lower reservoir. By 1916, both reservoirs were in operation. In the 1930s, the movie industry discovered Franklin Canyon's unspoiled beauty (and lack of palm trees! ), and made arrangements with DWP to use the area for filming. It was an ideal site, being close to the L.A. studios, but far enough from urban development and off-limits to the public. Claudette Colbert's famous hitch-hiking scene in "It Happened One Night" was filmed here in 1935. In 1940, the U.S. was still in an economic deptression, with a 35% unemployment rate. The Federal Government's "Works Projects Administration" (WPA) was created to provide jobs on a large scale, and to accomplish work that required more resources than local governments could afford. The WPA workers built the earthen "Flood Control Dam" at the northern end of what is now the Visitor's Center parking lot, and the winding system of concrete culverts, tunnels and walls to protect the reservoir from erosion, silt, and surface water contamination. They also planted the redwoods, pines, and other trees that surround the upper reservoir. After the 1971 Sylmar earthquake, the strength of the reservoir system was questioned, and studies were done to protect Los Angeles' water supply from a future, possibly stronger tremor. It was finally decided to take both the upper and lower reservoirs out of service, and to build a single, more modern and stable reservoir facility a quarter mile north of what-was-then the lower reservoir. This new rubber-covered facility became known as the Franklin 2 reservoir, and was operational in 1982. With DWP no longer in need of the upper reservoir, this area was now ripe for being developed into homes. Fortunately, a local political organizer and fund-raiser named Sooky Goldman envisioned this area as a unique educational facility for inner-city children, where they could experience nature and true wilderness only miles from downtown Los Angeles. With help from a few other concerned conservationists, she made steady progress in achieving this goal. In the early 80s, DWP built a new surge chamber at the north end of the upper reservoir and tunneled water under it. At this time also, plans were considered to demolish the concrete dam at the south end of the reservoir, and to divert the Heavenly Pond spring water into the creek that flows down the canyon. Thankfully, Sookie Goldman convinced DWP to preserve the reservoir and pond for educational purposes. However, DWP engineers determined that the reservoir level needed to be lowered approximatley fifteen feet for structural/safety reasons. Unfortunately, the lowering of the water level brought the depth at the northern third of the reservoir down to about four feet. Reeds began to grow and ducks made this area a habitat. With rotting vegetation slowly raising the bottom of the reservoir, this reed area is slowly encroaching south toward the dam, and the deepest part is now only ten feet.  The reeds are protected as an un-natural wetland, so the reservoir  as we [Combat! fans] know it  is slowly disappearing. In 1991, a formal agreement was reached between the DWP and the Federal Government to share ownership of the land. The DWP would maintain the surge chamber and other water-control equipment in the upper canyon, and the National Park Service would manage the land as a conservation center and public park. At that time, the Upper Reservoir was renamed Franklin Canyon Lake. This joint ownership agreement has preserved the area from developers, but DWP's once carefully manicured land is now reverting back to nature. The clean-cut Combat! sites are slowly disappearing in the undergrowth. The extremely wet spring of 1998 has accelerated this process, obscuring paths and burying landmarks that were plainly visible only one year ago! Bulldozing to repair flood damage and other erosion-protection measures have dramatically changed sites such as Sycamore Meadow, and DWP abandonment of places like Wild Pond have allowed nature to change their appearance remarkably in the last decade. The earthen Flood Control Dam at the north end of the Nature Center parking lot had been carefully kept free of trees (roots) for structural reasons, but is now barely recognizable. Many large, prominent and distinctive trees, seen over and over again in episodes, have since died and only their rotting trunks remain; however, other trees, including a few in Sycamore Meadow and the Redwood Room and adjacent areas, remain, although considerably larger than they were in the 1960s. Of course, the concrete culverts remain, although they are partially hidden by underbrush. Despite all the negative changes that have occurred to Combat! sites at Franklin Canyon in the last decade, we are very fortunate that the area has been preserved as well as it has. An attentive Combat! fan will still find much to see, and ample opportunity for "then and now" comparisons. As of August, 1998, Dion Osika and myself have confirmed 31 episodes, or parts of episodes, as being filmed at Franklin Canyon. The site is still being used, almost daily, by the film and television industry. Written in 1998, this article was originally included in the membership packet for RECON '98. Our thanks to Marty Black for researching this information. Copyright � 1998 by Marty Black. All rights reserved.